Find your perfect San Juan hotel by reading a description of each accommodation and checking their websites for rates, amenities, availability, and location. Many San Juan hotels are in downtown Friday Harbor. Some hotels are close to the ferry terminal and other near the waterfront. Other hotels also located at Roche Harbor. Friday Harbor House. 130 West Street, PO Box 1385, Friday Harbor, WA 98250. Phone: 360-378-8455; Toll-free: 1-866-722-7356; Fax: 360-378-8453. Friday Harbor House offers an intimate setting to relax and enjoy all your favorite San Juan Island activities. The inn features elegantly-appointed guestrooms with stunning views, an oversized jetted tub, and a cozy fireplace. 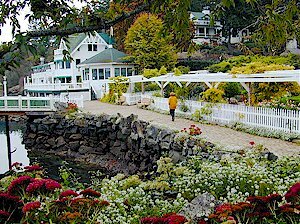 The restaurant at Friday Harbor House is a welcoming destination for locals and visitors alike. Wind down at the end of the day with a group of friends or enjoy an island dining experience featuring the freshest fare from local waters and farms. Guests will delight in the options offered in our lakefront accommodations on San Juan Island. The 10-room lodge offers cozy and romantic guestrooms. The log cabins accommodate up to six guests, perfect for families. For a beautiful outdoor experience, guests can enjoy "glamping" in one of our canvas cabins, or enjoy what was named as one of the Best Campgrounds in Evening Magazine's 2010 Best of Northwest Escapes contest. The Discovery Inn. 1016 Guard Street, Friday Harbor, WA 98250. Phone: 360-378-2000; Toll-free: 1-800-822-4753.